Before Michael Jordan took his place as the greatest basketball player of all time, Dr. J changed the game of basketball completely. You can thank him for all the crazy dunks and stunts you see today. 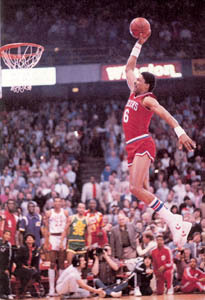 When Dr. J started playing professional basketball in the early 70s, the game was very fundamental. Pass, pass, layup… etc etc.. HELLO! BOOOOORING! He came into the game and started busting out crazy dunks, even from the free throw line! In 1983, Doctor J took the ball and swung it around the head of the Lakers’ top defender Michael Cooper in what is now known as “Rock the Baby”—regarded as one of the greatest dunks of all time. All these crazy feats and a history of winning earned him a place in the Hall of Fame and as one of the best players to ever play the game of basketball. Posted by fungoplay on August 26, 2011 in Sports.